Mega Fortune from Net Entertainment is the online slot machine that paid out the biggest jackpot as of now. In September 2011, a very lucky Norwegian slot player hit the progressive jackpot and won €11,736,375 which was confirmed as a record breaking online slot jackpot by the Guinness World Records. Mega Fortune has 5 reels and 25 pay lines. There’s a free spin feature as well as a bonus game. The bonus game is a wheel of fortune type of feature where you stop a spinning wheel and cash in on some fantastic wins. The theme in Mega Fortune is all about the luxury life that we all dream of. All the symbols are luxury items like rings, boats, limousines and champagne. Net Entertainments Mega Fortune slot is a great way to escape into an exciting world of wealth and fortune. If you get lucky enough, you might be the next one to hit the jackpot! 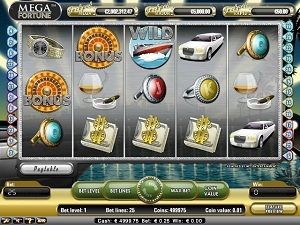 Mega Fortune is another example of the great quality of Net Entertainment’s slot machines. The graphics are very detailed and the background music is adding to the theme. The main colour scheme is grey but there are a lot of shiny gold and silver as you might imagine in a slot machine with this theme. The music is a type of funky rhythm and blues and it works in consistency with the slot machine’s theme. All symbols are themed related, even the card deck symbols J to A, which are designed as rings. Apart from these symbols, you will see a lot of iconic symbols of wealth; limousines, gold watches, and cognac & cigars. The wild is a cool speed boat and it will substitute for all other symbols except for scatters and bonus symbols. The scatter is the Champagne symbol and if you hit three or more of them, you will trigger the free spin feature. The bonus symbol is the wheel symbol. If you hit three or more of it, you will start the bonus game. The free spin feature is triggered by hitting three or more scatters on the reels. Once you have done this, you pick one of the scatters to reveal the number of free spins that you will be rewarded. The maximum multiplier you can get is X5. You can win additional free spin while playing the feature by hitting at least two scatters. The bonus game is a spinning wheel feature that has three different wheels. The bonus game is triggered by hitting three bonus symbols in succession, leftmost to right. The first wheel gives a chance of a coin win or to play the next wheel. The second and third wheels give chances of a coin or Jackpot win. If a wheel stops on an arrow, the next wheel starts spinning. Mega Fortune has 5 reels with 25 pay lines for you to bet on. The minimum bet per line is 0.01 coins while the maximum is 0.50 coins per line. There is also an auto play function which is very comfortable to use. You activate this function by clicking on the Auto button in the lower left part of the game window.